Save Metropolis and Louis Lane in this child's deluxe Superman costume. 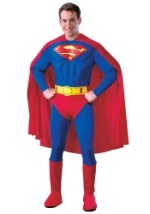 This classic superhero look includes a blue, polyester jumpsuit that has long sleeves and attached red briefs. The chest is filled with foam padding for a muscular appearance. Superman's signature logo is printed large and proudly on the chest. The jumpsuit also features attached, red boot tops. A yellow foam belt and cape complete this iconic costume.